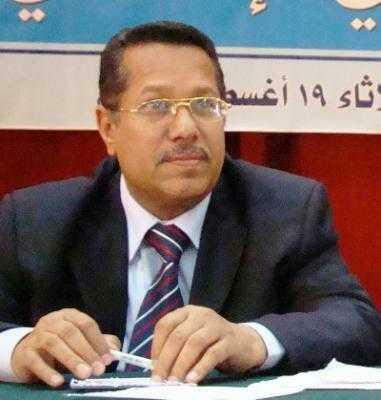 Almotamar.net - Assistant Secretary General of the ruling General People’s Congress GPC Ahmed Ubeid Bin Daghr has said that Yemen, similar to any country, is experiencing a state of political democratic activity , expressing interaction among different forces , ideas and means. In an interview to the Lebanese Al-Mustaqbal newspaper published Monday Bin Daghr pointed out that Yemen is not away from what is occurring in the region, along wit its preservation of its special characteristic in the political life, in the history of internal evolution and aspirations to future. Yemen has its own national constants the people rally behind and the changes, which took place since the revolutions of 1962 and 1963 and following that, the unity in 1990, have consolidated among the Yemenis national convictions in way of thinking of the leaders and the mass people’s movement. He said there are no dangers against Yemen but what is going on in it is in fact a political action the Yemenis have been accustomed to since the establishment of the unity state in 1990. Bin Daghr added that what is happening in Saada and in the southern governorates of Yemen bears no great dangers but there are political ramifications, the larger portion of them are the result of economic difficulties as the country is passing through a transitional stage and is trying to beat its way towards the future, and to build a strong economy and depart from the circles of poverty, ignorance and disease. The Assistant Secretary General of the GPC has pointed out that there are problems in some areas of the country, classified as political ramifications despite exaggerating them by the opposition by claiming that there is a crisis and that Yemen is on a crater. There is a problem in some districts of Sana’a, Saada and some districts of the southern and eastern governorates but it has not amounted to the level of a crisis and would not reach that absolutely, he added. Bin Daghr also talked about tackling the problems of the retired military men or those that deserted service two years before, and said the President of the republic stayed in Aden for almost three months and took important decisions in this regard, among them reinstating all those out of service to their jobs and giving the retired all their rights and dues. He asserted non-existence of change in temperament of people in the southern and eastern regions against the unity. Part of the opposition inside the Yemen Socialist party or inside some other parties raise other slogans, such as the right to self-determination and the right to independence and there are some local councils members who are dragged behind those slogans, Bin Daghr added. He affirmed that those who take to the streets raising slogans of independence and restoration of the south state do not express the south or all the southern governorates because the general temperament is still with the unity. He has drawn the attention that there is a huge amount of media propaganda against the unity and another large quantity of conspiracies against the unity and the Yemeni state; inside and outside, aimed at dismembering Yemen and the inlet to that is to change the temperament from unity and to re-draft the people awareness against it. On the other hand Bin Daghr said the terrorist acts in Yemen arouse a problem and a state of instability and their consequences affect the policy, economy and security in the country but their effect may more clearly affect the area of tourism. He stressed that the war on terror would continue because there is an interest in that for Yemen and the international community and Yemen is part of this community.